A friend is thinking of a buying good-condition second-hand Dahon for a gentle, self-supported trip to Europe this spring. We're not planning major hills, and we'll stay in hotels or AirBnB. But the bike will need to scrunch into a suitcase (or a well padded bag) for the plane ride over, and then fit panniers for luggage for the trip. Do you think this will work? I have a Bike Friday, and know that the travel/pannier set-up is good. But I don't know much about the Dahon. I've read a few reviews where their more performance orientated folders with low profile tyres can give a more harsh ride which may not be ideal for touring. I would suspect their steel framed folding bikes would be better for touring. For sheer mechanical strength and reliability I would favour a freehub based drivetrain. Maybe something like the Boardwalk D8? I'm not an expert on Dahon though but on face value that looks one of the best options in their range. Bikes: In service - FSIR Spin 3.0, Bannard Sunny minivelo, Dahon Dash Altena folder. Several others in construction or temporarily decommissioned. 10L Topeak Seatpost bag, and 18L dry-bag on Tern Luggage Truss and Kanga Rack. I still have volume and weight capacity to spare. The bags come off and on the bike in seconds. I don't see why this would not work for placid, Credit-card touring in Europe. we here have a dahon curve d3 buyed specialy to be casemodded to touring. next think to do is to casemod one Shimano nexus IGN to fix the 122mm old. botton line: Dahon Curve 16¨ wheels is and very good base to set up a compact and afordable touring bike. Brompton bags are the way to go. No reason why the rear one couldn’t be adapted to fit on most racks. Will have to look at the bike, and at packing options. If it means buying new luggage and/or a mount for (not cheap) Brompton luggage, the bike may not be the best option for her. I can't comment on a Dahon, my folder is an Airnimal. If you are trying to mount a rack for panniers, check out the RackTime rack called FoldIt. This version, the part of the rack that attaches to the frame dropouts is welded to the bars that extend upright. This version, instead of being welded it is bolted and can be adjusted for height. With panniers, might need to be adjusted to highest so that the pannier does not interfere with the gearing. This rack is quite easy to break down for transport. This is the version I bought for my folder. I also needed to buy the longest mounting stay as a seperate option. I honestly have no clue how it would work because I am not familiar with Dahons, but this is the rack that works for my folder. If it won't work with a Dahon, perhaps someone will comment. Another great argument to use curve d3 as a bike for touring is the tyres, as its uses 305 mm schwalbe big apple for a very plushy and confortable ride. Last edited by BromptonINrio; 03-22-18 at 05:36 AM. Repairs: From my understanding, 26" tires are a safe bet around the world and is easier to find. If you had a flat or needed a new tire, was it challenging finding spare parts? While not as compact as Dahons and bikes of similar sizes, if that was an issue then I may consider a Montague folder instead. if one has a flat tire, one fixes the flat tire. no need to go to a store or find replacements. you always bring a tire repair kit, spare inner tubes, a pump, and you fix it. if you can't do that yourself, you have no business touring. people have toured around the world in one set of tires. shredding a tire outright, provided the tire is of high quality and designed for the rigors of touring, is rare. but if you still want to be safe, just carry a spare foldable tire. I am on my second tour with Schwalbe Marathon Supremes 42-406, and they are still like new. I have had no flat tires since i installed them in October 2016. Schwalbe Marathon Supreme or Marathon Mondials is what you want. Regrettably they are no longer made in 406 size. you can still find discontinued Supremes on the web, but they ain't cheap. if you decide to go with ISO559 (26") tires, the Surly Extraterrestrials are also worth a look. Last edited by Abu Mahendra; 03-22-18 at 07:21 PM. Ugh... some tourers should steal ideas from the ultra-light backpacking crowd - getting rid of *most* of that stuff would be so liberating, especially to folding bike tourers that have so many multi-modal options. Assuming you could store a suitcase at starting/ending point, you could self-supported (camping & cooking) tour from a Dahon Speed P8 with one 62" check-in and one carry-on (I already tour out of a single Brompton 30L front T-bag). i agree. piling on so much sh!te on a folder undoes its maneuverability and agility. great, you can fold the bike, but the sh!te you are carrying is now more voluminous that the foldie itself. Plus, packing is just so wrong on two of those images. we have had that discussion before. a trekking pack standing up? come on. i go back to my original question: do you need panniers for the trip at hand? I circled Taiwan and Malaysia on a Dahon D8. No problems other than replacing the brakes. I wasn't camping though, just CC touring. It was very useful for buses and just generally a great bike. My buddy who recommended it has the same bike. He was front and back panniers on his and has done well over 10,000km touring with it. I've travelled with a Bike Friday. I usually bring one spare tire, and a couple of spare tubes, as well as a patch kit. If I shred two tires, I guess I'm out of luck. This is good info, thanks. I haven’t seen anyone mention derailleurs getting caught or bent during their travels so I’m guessing it doesn’t happen very often? No one seems to sell their used Dahons with an IGH in my area. I never had a problem. Chain fell off twice randomly. Popped it back on. I also boxed up the bike on three flights and found it fine on the other end. I did remove the derailleur before boxing. Would you use a internal hub for touring? On face value I wouldn't feel comfortable with that knowing a mechanical fault could mean the end of touring. Maybe a rohloff or more simple 3 speed hub but not sure. A derailleur setup seems safer or even single speed if going somewhere relatively flat. There's a company near me that specialises in touring bikes and they seem very keen on the Rohloff hub. You get a choice basically of derailleur equipped or Rohloff bikes and no other options. Saying that those are serious touring bikes that take serious weight and abuse. I mean if you get a problem with a derailleur system you can often rig it as a single speed or get it back working to a degree but there is the possibility with internal geared hubs they will make the bike unusable. If the hub gearing breaks up inside, a part cracks etc you can't ride it. i have in the past. i just did now. With a SRAM Dual Drive IGH. Depends on how and where you like to tour of course, but one of the advantages of folder touring is that we have the multi-modal option. If you break down and do not have parts or tools to repair on the spot, then just start hitchhiking or call a taxi or Uber. 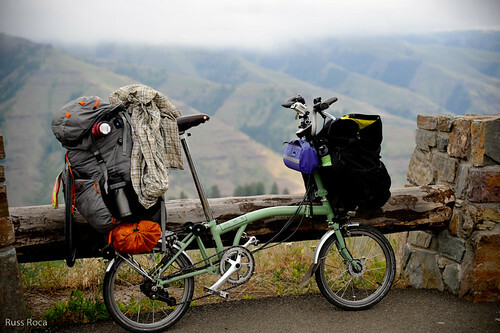 Actually, I'm really interested in incorporating hitchhiking into my folding bicycle touring to cut out the boring and dangerous ride sections. I'm personally into ultra-compact touring and can fit my entire touring rig (Brompton + T-bag rigged for camping) on my lap while riding in the front passenger seat of any car. Tools/inner tube/pump for minor repairs, flat tire, and adjustments are permanent resident inside the bike's frame and seat tube. I have not toured on my folder yet. I have toured on my two Thorns (one with Rohloff and one with derailleurs) and I have toured on my Lynskey Backroad (a Titanium derailleur touring bike). I had another derailleur touring bike that I no longer have, toured on that too. On my folder I have an 8 speed cassette on a Sram Dual Drive IGH, and I could easily see touring on it. If I do decide to tour on my folder, it would likely be lighter weight touring where I would want a folder for taking on trains, buses, etc. But it would have to be lighter weight touring because if I am getting on buses and trains, I do not want to hauling around the same kind of heavy and voluminous stuff that I would be carrying for a tour of several weeks in the wilderness. Lighter weight touring where folding is not an advantage, i would use my Lynskey Backroad. Medium weight touring I use my Thorn derailleur bike (Sherpa model). And heavy duty touring on my Thorn with the Rohloff (Nomad with S&S). I would trust the Rohloff more than the Dual Drive IGH, but for light weight traveling I see no reason to worry about the Dual Drive. But yeah, a cheap Dahon would be suffice for what you're doing ,with a few luggage bags. I had a full triple pannier with a sleeping bag/tent/travelling stool on my Dahon for a small tour once, didn't effect the bike whatsoever. Brilliant little thing.